With an eye on underlining the performance credentials of the newly launched NSX and particularly its engine, Acura set up an IMSA GTP Lights effort for the 1991 season. This was the first top flight competition effort for Honda's recently established luxury subsidiary. To develop and run the cars, the help of Comptech Racing was called in. Originally established by Doug Peterson and Don Erb as an engine specialist, Comptech had successfully fielded several Hondas for lead-driver Parker Johnstone. 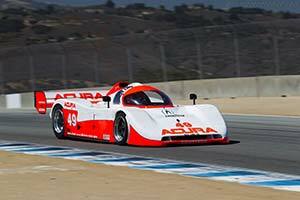 In 1990, the team had also campaigned a Pontiac four-cylinder engined Spice in the GTP Lights class. Johnstone won the team's very first race at this level, in a season dominated by Buick and Ferrari engined Spices. Very much a known quantity and the most competitive chassis available, it was only logical that for the new Acura effort, Comptech went for Spice chassis again in 1991. The team's existing car was upgraded to the latest specifications, while Acura ordered several more cars from the British manufacturer. These were among the very last Spices built as Spice changed hands and its name before the end of the year. An evolutionary design of the model introduced in 1988, the latest Spice featured an aluminium monocoque with carbon-fibre composite reinforcements. The suspension was by double wishbones with push-rod actuated coil springs and dampers. These were mounted in-board to make room for the ground-effect tunnels that generated much of the machine's downforce. Comptech worked their magic on the already highly tuned V6-engine derived from the new NSX sports car. Displacing just under three litres, it was good for 270 bhp in road-going trim. By the time, the all-aluminium unit was mounted in the Spice chassis, it was good for around 425 bhp despite the relatively restrictive regulations. This power was transferred to the rear wheels through a Hewland five-speed gearbox.